In the 1600s, the Japanese developed a method of technical analysis to analyze the price of rice contracts. This technique is called candlestick charting. Steven Nison is credited with popularizing candlestick charting and has become recognized as the leading expert on their interpretation. Each candlestick represents one period (e.g., day) of data. The figure below displays the elements of a candle. I have met investors who are attracted to candlestick charts by their mystique–maybe they are the “long forgotten Asian secret” to investment analysis. Other investors are turned-off by this mystique–they are only charts, right? Regardless of your feelings about the heritage of candlestick charting, I strongly encourage you to explore their use. Candlestick charts dramatically illustrate changes in the underlying supply/demand lines. This pattern suggests a minor reversal when it appears after a rally. The star’s body must appear near the low price and the line should have a long upper shadow. This line also signifies a turning point. It occurs when the open and close are the same, and the low is significantly lower than the open, high, and closing prices. This line also signifies a turning point. 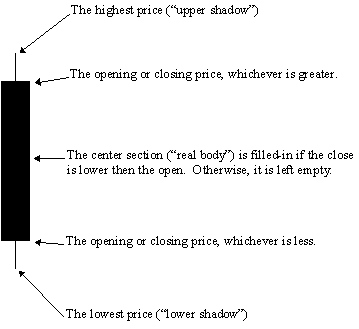 It occurs when the open, close, and low are the same, and the high is significantly higher than the open, low, and closing prices. Stars indicate reversals. A star is a line with a small real body that occurs after a line with a much larger real body, where the real bodies do not overlap. The shadows may overlap. These are neutral lines. They occur when the distance between the high and low, and the distance between the open and close, are relatively small. This line implies indecision. The security opened and closed at the same price. These lines can appear in several different patterns. Double doji lines (two adjacent doji lines) imply that a forceful move will follow a breakout from the current indecision. This pattern indicates a decrease in momentum. It occurs when a line with a small body falls within the area of a larger body. In this example, a bullish (empty) line with a long body is followed by a weak bearish (filled-in) line. This implies a decrease in the bullish momentum. This pattern also indicates a decrease in momentum. The pattern is similar to a harami, except the second line is a doji (signifying indecision).